In 1977 thousands of moped shops sprang up across America. About half of all the bicycle shops and half of all the lawnmower shops became moped shops. Myrons Mopeds and Bikes sold Ross, Mongoose bicycles and Puch, Tomos, Motobecane, Derbi mopeds. Below left is the original logo, in it’s cleanest version, before it was copied over and over. For the first time you can see the bike has rear springs and the riders tongue is hanging out. It is a 1980 Orange County Yellow Pages Ad. There were 55 moped shops in that phone book alone. So Southern California probably had 150-200 moped shops. Mopeds were as common as motorcycles on the streets of America in 1980. Only Volkswagen Beetles were more common than mopeds, it seems. 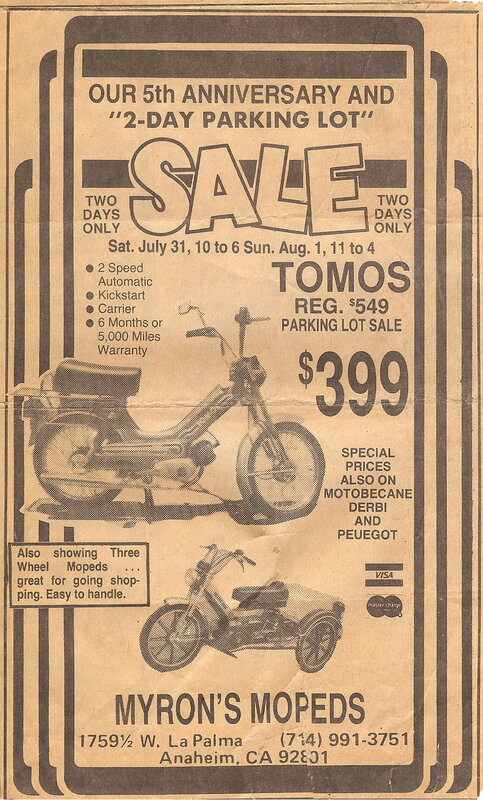 In 1982 Myrons Mopeds celebrated it’s Fifth Anniversary by having a 2-day parking lot sale. 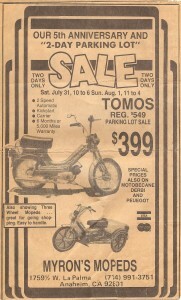 Below right is a newspaper ad, where 1980 Tomos Bullets were on sale for only $399, regularly $549. Now the equivalent 2011 Tomos Sprints cost $1199, or a little more than double. In 1986, below, Myron was at his desk on the phone, with his employee Sam. This was the old location on La Palma in Anaheim. Many of the signs and things like Myron’s fan (from a different photo) and the 1980-style Tomos clock are still around and working. 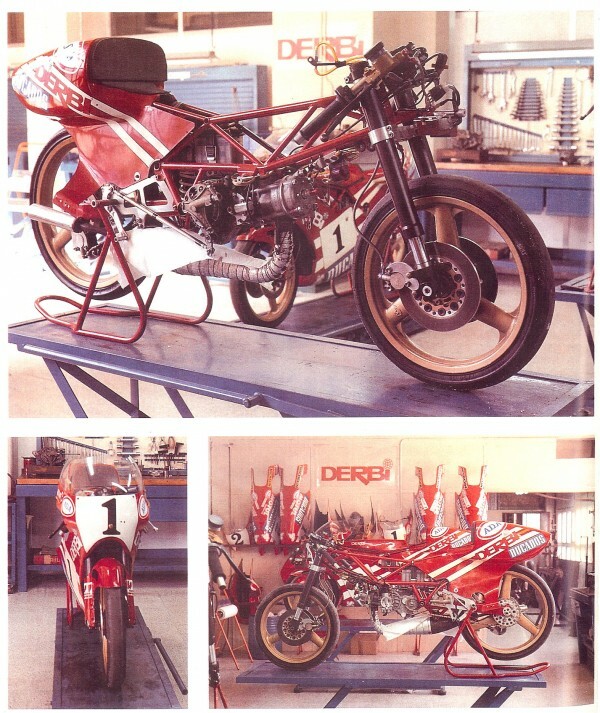 By then Myrons Mopeds was a licensed motor vehicle dealer, selling new and used motorcycles, especially the 1986-87 Trac DH100, a Korean bike with a Honda 90 compatible engine. You can tell Myron liked the DH100 by the lone poster on the front of his desk. 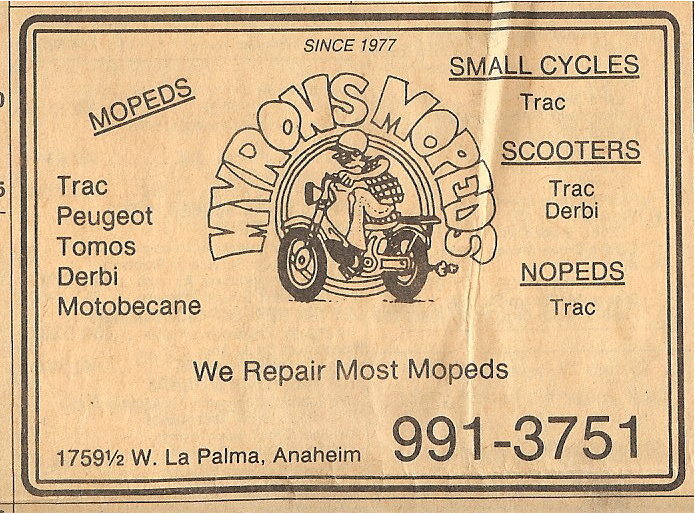 In 1986, below left, Myrons Mopeds, under Myron Hankins ownership, ran a small ad in the 1986 North Orange County Yellow Pages. In 1990, below right, Myrons Mopeds under Sam Townsend’s ownership, ran a small ad in the Cal State University Fullerton newspaper. The first mention of Go-Peds appears. Look up Go-Ped in Mopeds A-Z if you want to know what one is. 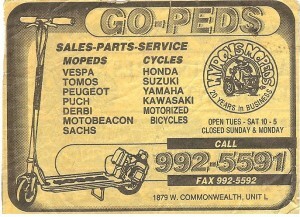 In the 1990’s Go-peds ruled the moped shop. In 1988 Myron was ready to retire. Below are Sam and Myron in front of the shop. Myron is getting ready to hand over the torch. In 1989 Myron was living in Costa Rica. In 1999 he visited the “new” shop on Commonwealth, when Shaun, soon to be “Myron #3” had the privilege of shaking Myron’s hand. Nobody knows when Myron Hankins passed away. We can only assume that he’s no longer alive, because of his age, would be well over 100. 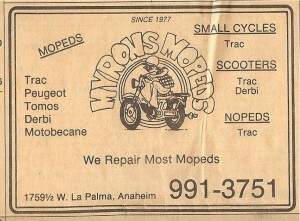 In 1997, below left, Myrons Mopeds proclaimed 20 years in business in this North Orange County Yellow Pages ad. 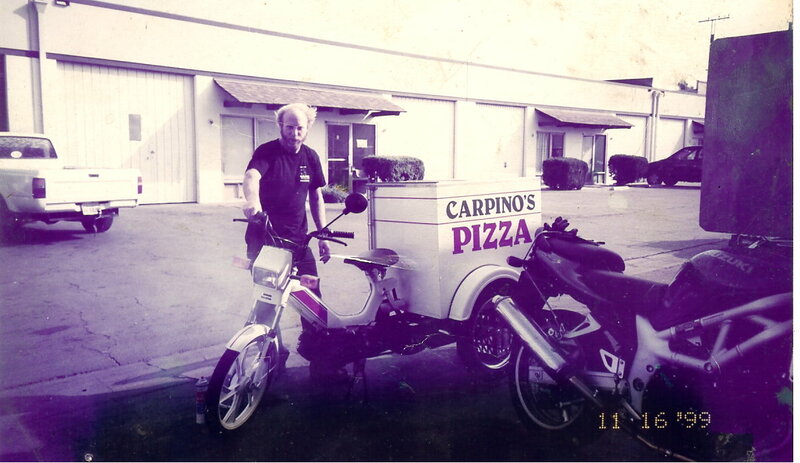 Sam and his enthusiastic employee Steve Roy were one of the first moped shops on the Internet in 1993. In those 1990’s Internet postings, Steve was the “Moped Guru” who wrote the famous “shade tree moped tutorial”. In it he starts by advising the reader to find a shade tree to work under. Steve fixed hundreds of mopeds at Myrons until around 1997, when mopeds were pretty much dead and go-peds were the exact opposite – booming. In about 2002 Steve Roy passed away, from lung cancer, even though he hadn’t smoked for many years. That’s two less pillars of moped society, Myron and Steve. 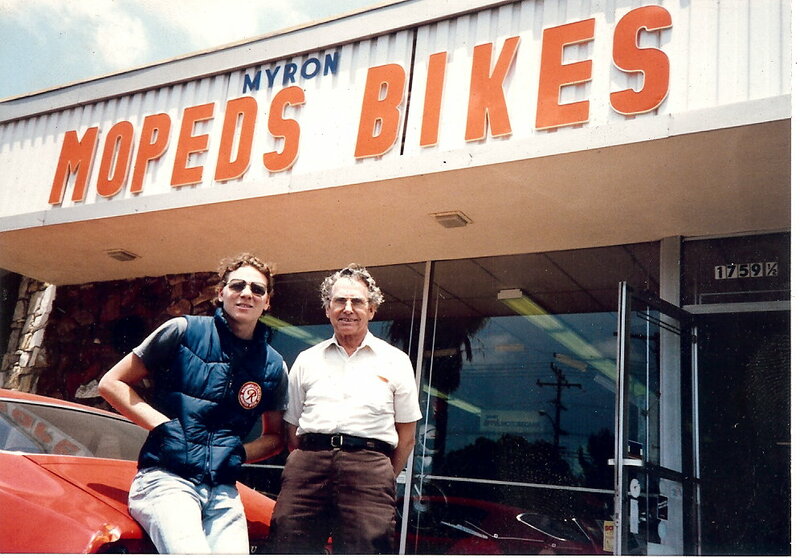 In 1998, Sam changed the name to Myrons Extreme Machines, as go-peds became 99% of the business. In 1999, above right, Shaun Strahm was working for Sam at Myrons Extreme Machines. 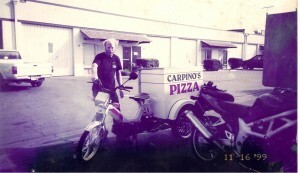 Here he is out back fixing a smokey pizza delivery Tomos trike. Strahm came from Royal Cyclery, an entirely different moped shop on the other side of Los Angeles, in Hawthorne. He had been fixing mopeds there since 1978, working for his father, Gary Strahm. In 1993, below, Strahm is standing in front of Royal Cyclery with Cummings’ 50cc speed record motorcycle. 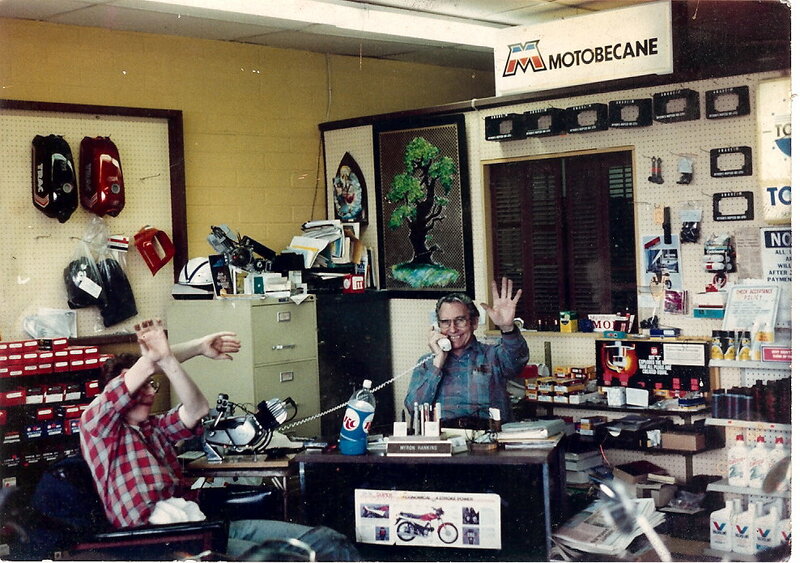 In 1994, above left, Gary Strahm and Bear with Shaun Strahm’s 1990 Honda NS50, in Royal Cyclery’s showroom. 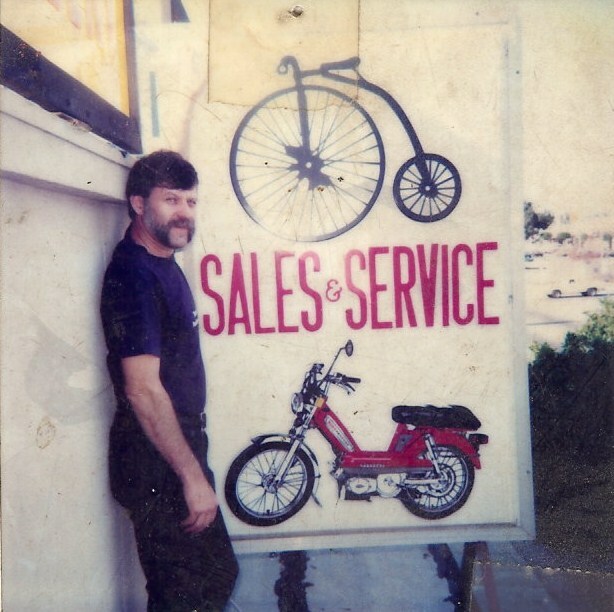 Above right, Gary Strahm in 1987 on the roof of Royal Cyclery’s new location at 13339 Hawthorne Blvd, Hawthorne CA, later to become 13355 three doors down, in 1990. You can see the bicycle and moped each have an equal share of the sign. 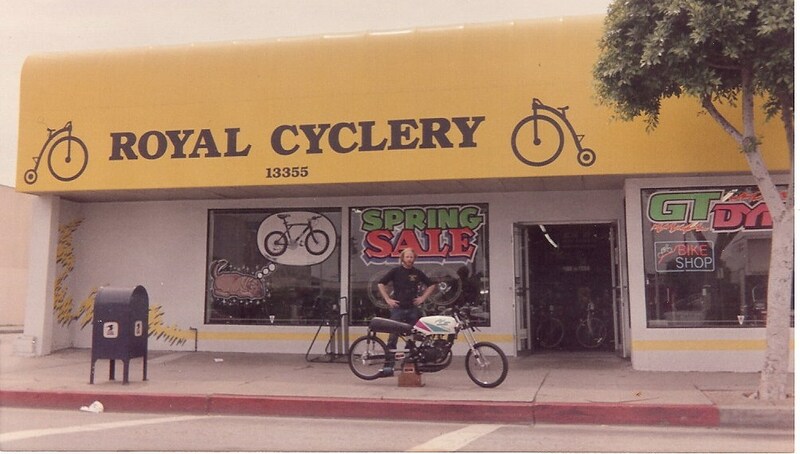 From 1977 to 1987 Royal Cyclery was in at 2686 W Imperial in Inglewood. That’s where he learned how to fix mopeds. Tragedy struck Royal Cyclery in 1996 when Gary Strahm was killed in an armed robbery. Two years later Royal Cyclery was closed for good and liquidated. The only remaining moped shops in the LA area were Cycletime in West Los Angeles and Myrons Mopeds in Fullerton. 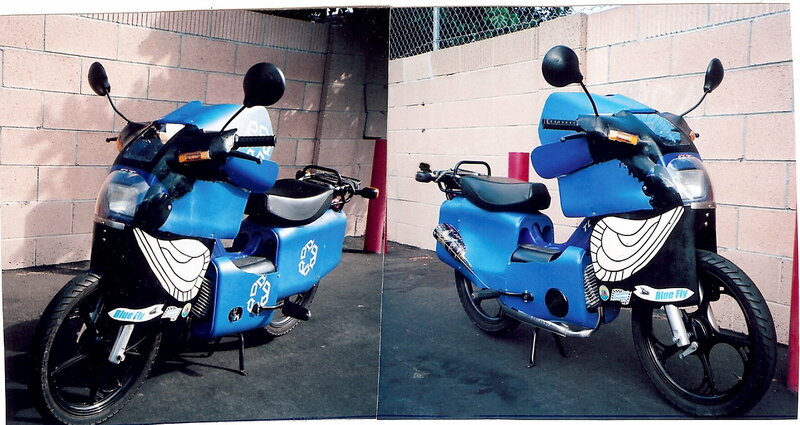 For a few months Shaun helped out at Cycletime, and also did a summer of mobile moped service on Catalina Island. 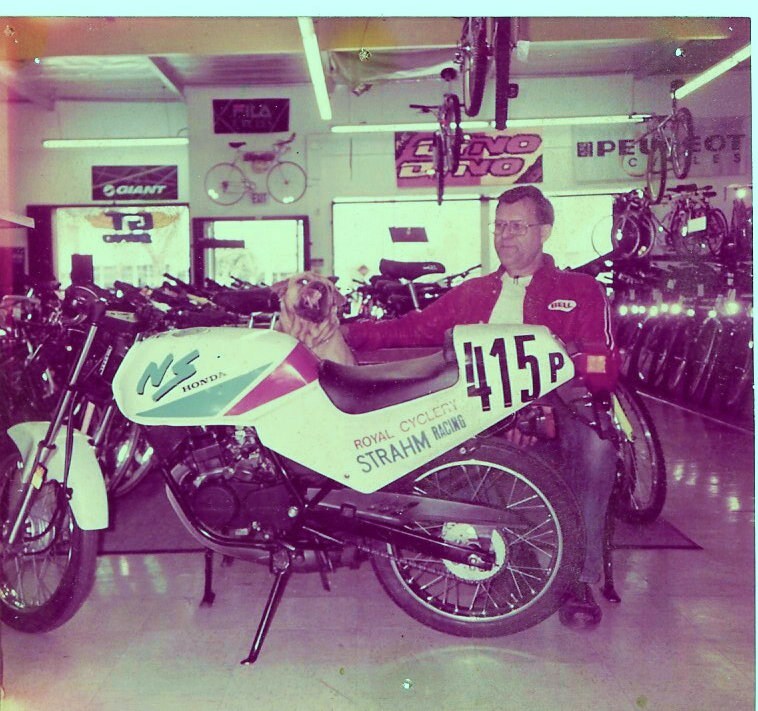 In 1998 Strahm came to work for Sam Townsend so he could continue his passion, to fix and sell mopeds. Until late 2000 he worked for Myrons Extreme Machines, where there was barely room for both mopeds and gopeds. Then Strahm purchased the moped department of Myrons Extreme Machines and the name Myrons Mopeds from Townsend. Sam passed Myron’s torch to Shaun, and moved the go-ped department out to another unit. So then there were two Myrons in Fullerton, as there still is. What’s even more confusing is they’re both on Commonwealth and their phone numbers are almost the same. 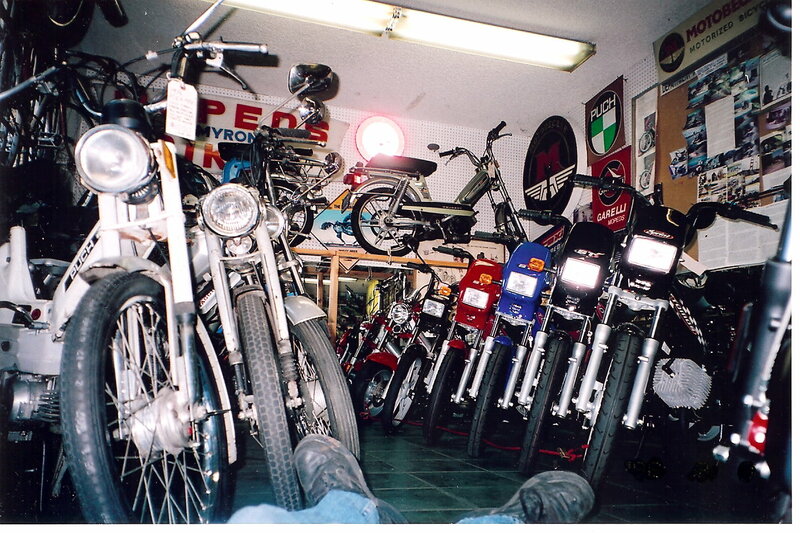 In 2002 Myrons Mopeds had all of the showroom bikes outside for this picture. Electric bicycles on the left, used mopeds in the middle, and new mopeds, Avanti, Solex and Tomos on the right. In 2004 Myrons stopped selling electric bicycles. In 2010 Myrons stopped selling used mopeds. Now it’s only new Tomos. 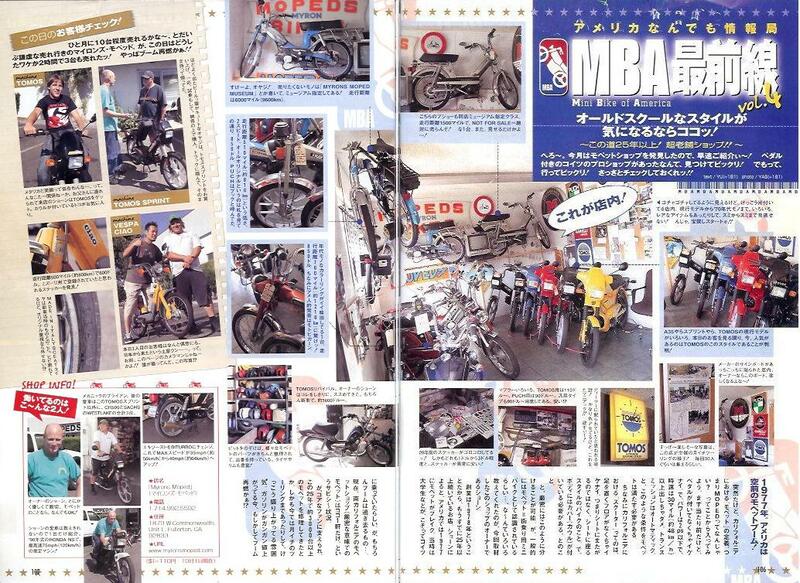 In 2004 Japanese 50cc sport bike magazine Moto Champ did this article about Myrons Mopeds. In 2007 the showroom contained about 10 used and 10 new mopeds. They’re all looking at the camera like puppies in a pet store, wondering if someone will take them home. Welcome to Myrons Mopeds shop, a 20ft x 60ft industrial unit, packed full of mopeds and parts. 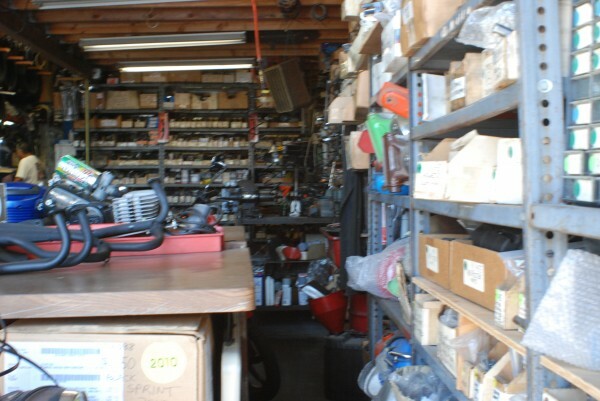 The parts department is made from about 20 other moped shops buy outs. Many local moped shop that went out of business in the 1980’s would sell their remaining inventory to Myrons Mopeds. The parts are located in alphabetical order by major brand. At the front is Batavus, Cimatti Derbi, Foxi, then Garelli, General, Honda, Minarelli, Morini, Motobecane, Peugeot. Then there is universal parts surrounding the service area. To the rear of that is Puch and Tomos. 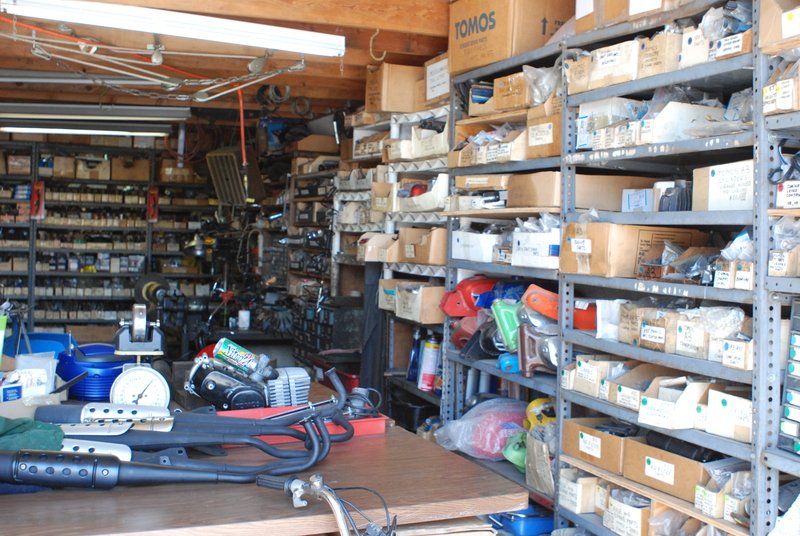 Upstairs is Sachs, Trac, Vespa, more universal, and overstock. The number of dealer notebooks gives the estimate of about 20 buyouts. There are 12 Motobecane Dealer Manuals. There are about 8 Puch Dealer Manuals. There was a large wall full of printed material, mostly parts manuals, some service manuals, advertisements, and a few historic documents. The paperwork was in disarray, with pages missing, falling out. In 2000 to 2002 Shaun organized all of the documents, restored missing pages, and found the best original photos. The Mopeds A-Z Encyclopedia was made from all that printed material. 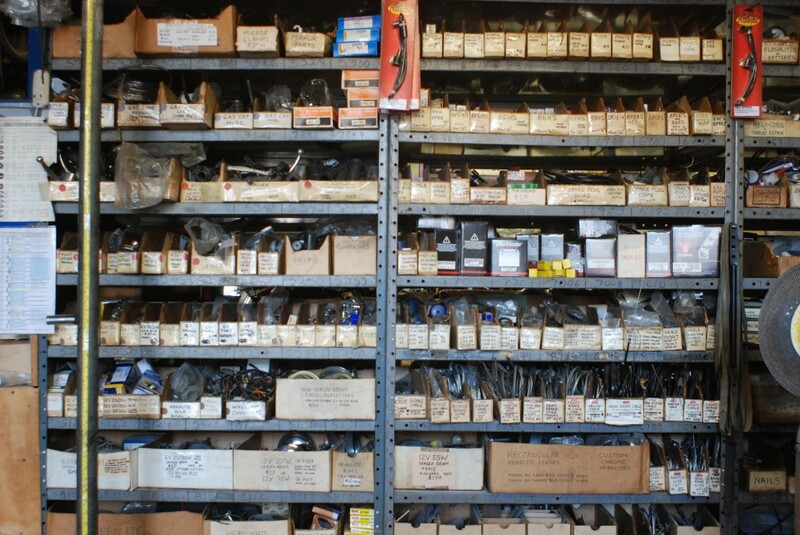 The main part of the Universal Section, for things that are mostly not brand specific, like mirrors, spark plugs, chains, bearings, batteries, levers, points, bulbs, pedals, etc. This is Blue Fly One. It’s a 2007 Tomos ST with a aero body. It has over 9000 miles and was Shaun’s daily driver from 2007 to 2009. It was Shaun’s project to go over 50 with a stock engine. It went 53 with this fork mount fairing. But then Shaun seized and crashed. A year later he made a frame mount fairing for it. It is called Blue Fly Two and is currently in retirement. This is the Lama Limo, under construction. 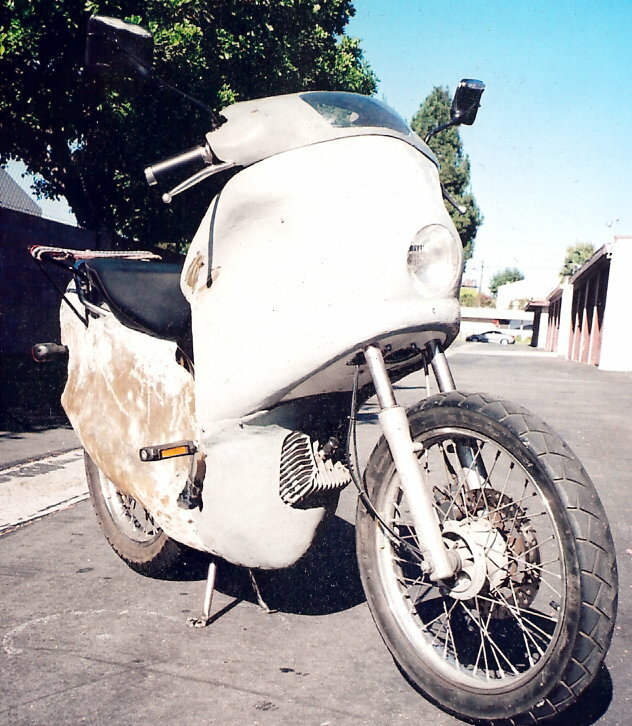 It’s a 2005 Tomos Streetmate that goes over 50 with a stock engine, thanks to a fiberglass body. It’s all about safety and economy first, speed second. It carries Shaun’s dog Lama and has been his daily driver since 2009 with over 13,000 miles and counting. This is Shaun’s “dream bike”, not exactly a daily driver, but faster than anything else that lightweight. The fastest and latest Derbi road race machine, a 79cc 6-speed that goes 136mph. 50cc did 126+mph. You are currently browsing the archives for the Shop Tour category.